All of the sellers you see listed below are current consignment vendors with us, and sell on a monthly basis. As long as they renew their seller contracts each month, we will post them here. New sellers will be added as their contracts and payments are accepted, and as time permits. Feel free to contact them directly, if they've chosen to have their information included on this page, or find a little time to come in and shop with us on the weekends. 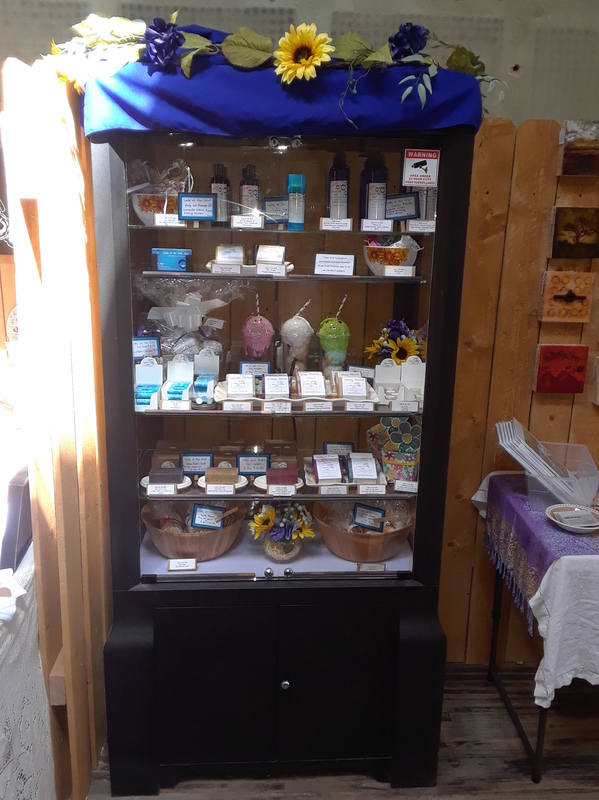 JDP Wood Works creates beautiful custom made wishing wells, windmills, birdhouses, beer and wine carriers with accessories, yard flags, and so much more..
Lady At The Well provides a wide variety of popular healing personal care products. They use chemical and pesticides-free processes, and use the sun to infuse their oils. Also, many of their herbs are grown in Loveland, Colorado. Trinkets-n-Treasures specializes in cutting and clasping pure stainless steel necklace chain, measured based on customer request. We create fine necklaces, bracelets and anklets for people, using over 40 options of stainless steel chain stored on large spools, each. About half our options are plated in 18k gold, too. We've also started carrying about 25 options of colored leather neck bands for pendants as well. 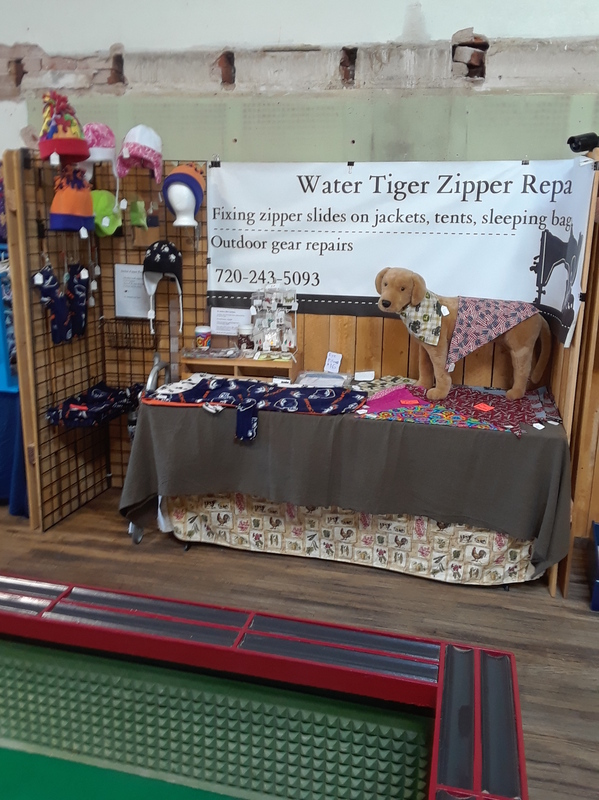 Water Tigers produces a wide variety of things, but currently has the following displayed with us: Soft fleece beanies and caps, fleece neck warmers, fleece scarves, cotton pet bandannas, jewelry, and preservatives-free frozen dog treats. 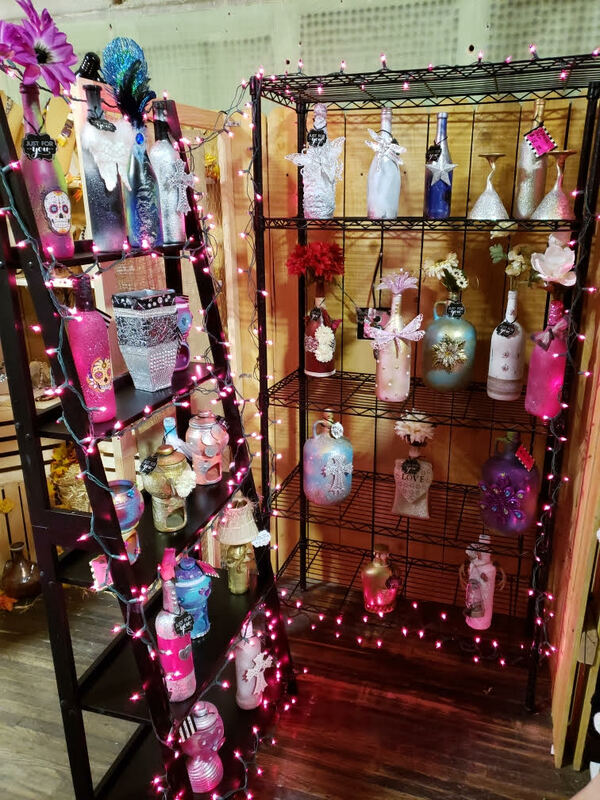 Lovely And Mad has some very unique and extremely artistic bottle creations. 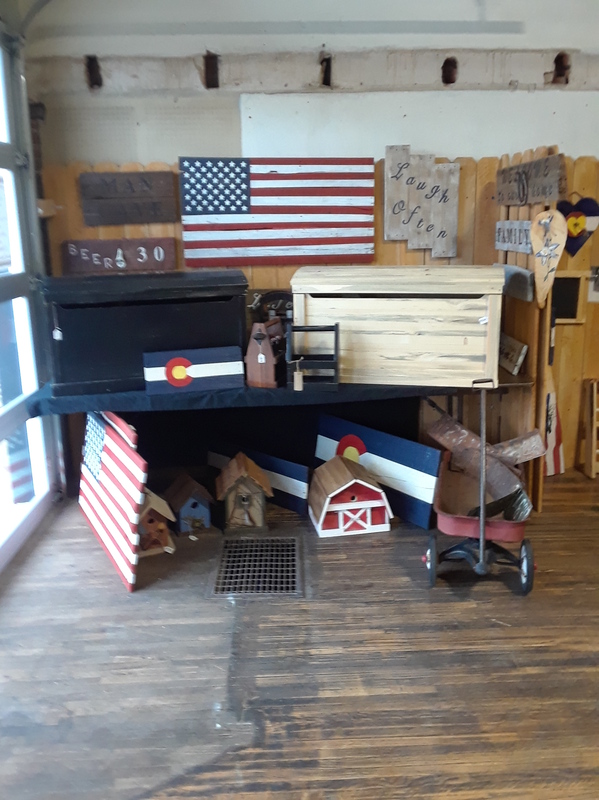 Come check them out, and see if YOU will be as impressed as we are. 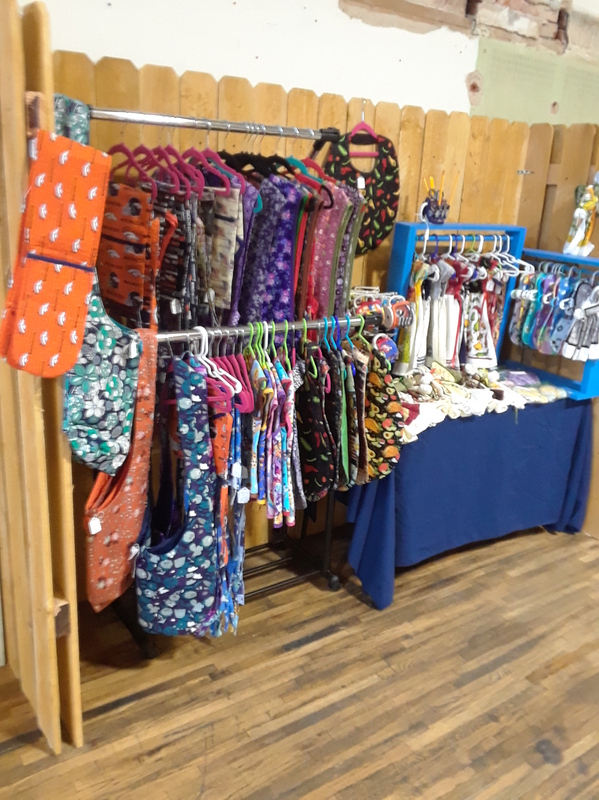 Susie's Homemade Aprons and More specializes in creating TONS of really fun and cool things thru sewing. 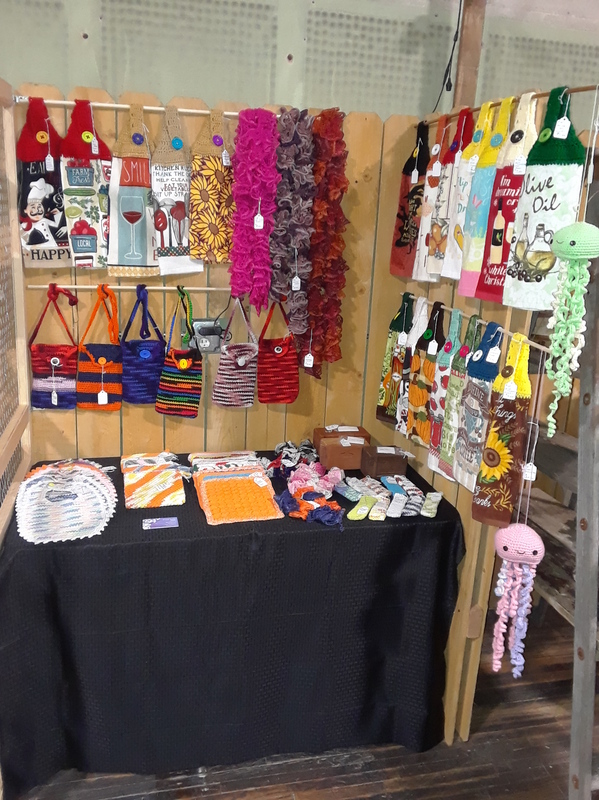 She makes adult and childrens' aprons, oven door apron towels, bibs, hobo bags, casserole mittens, pencil holders, angels (made with towels), and SO much more! 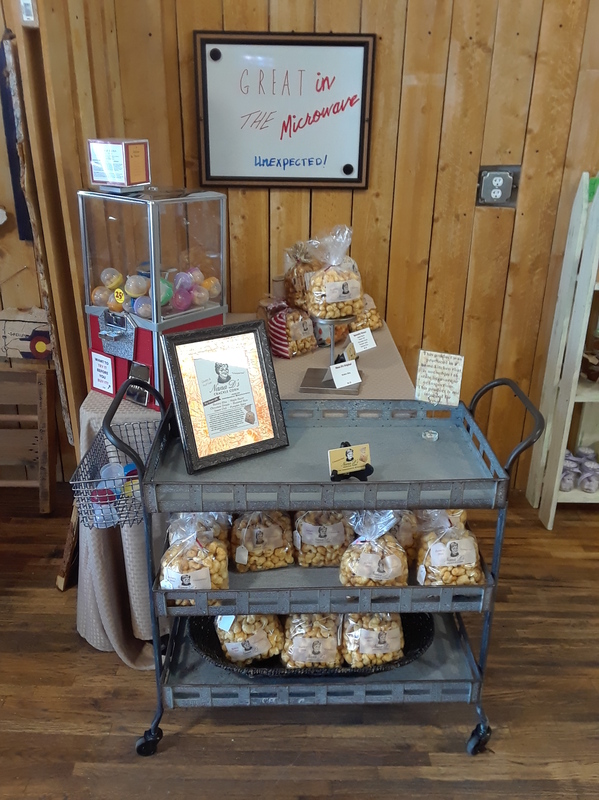 Nana D's Crackle Corn offers a variety of fun crackle corn flavors that melt in your mouth, giving you tasteful pleasures beyond imagination! 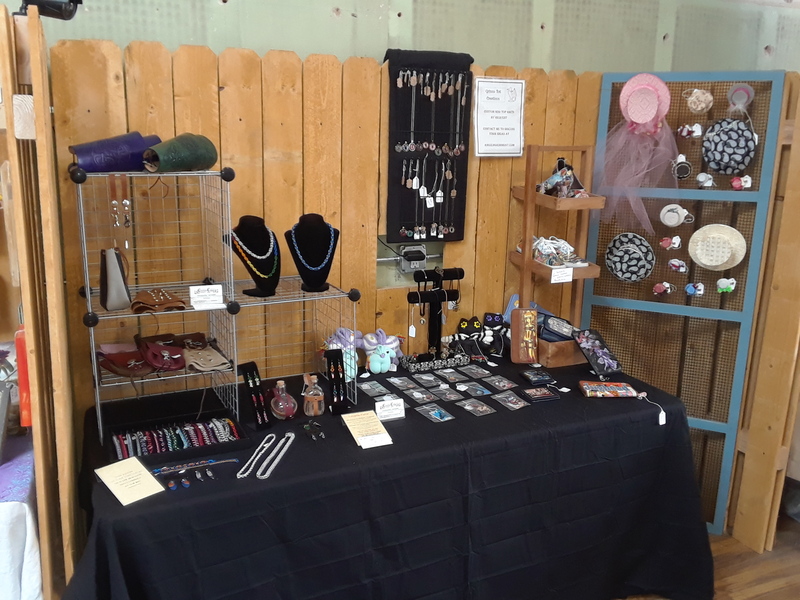 Swing by her booth at Trinkets-n-Treasures, and see for yourself. D Hill Designs offers several unique options of greeting and general purpose cards, with a beautiful artistic touch. 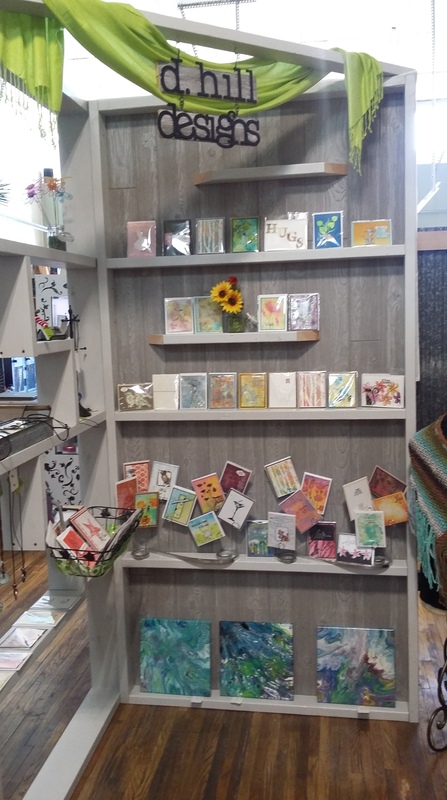 Come look around, and see if you can find that perfect one-of-a-kind card or more. 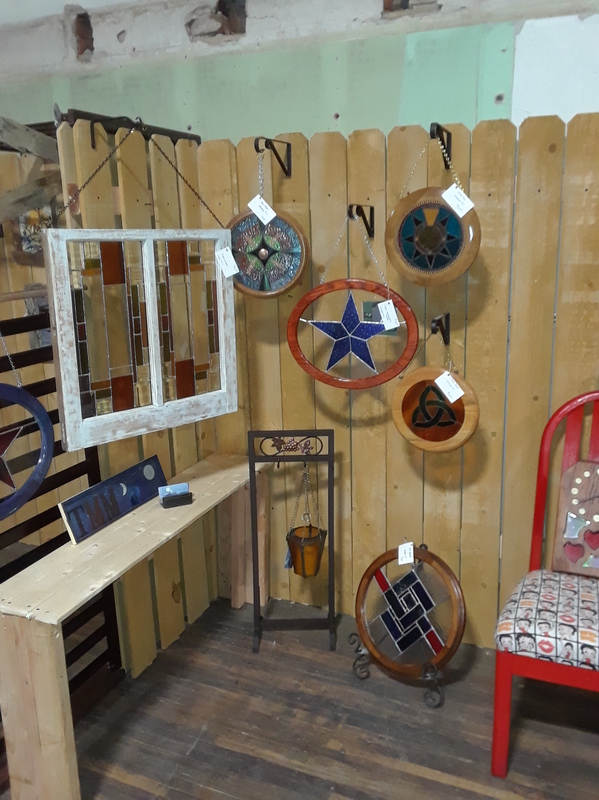 Two Moons Mountain create some absolutely beautiful works of art in the form of stained glass display pieces. It's truly both a labor of love, and a family affair, as wife, husband and son are all actively involved, and supportive of each other. Cryptic Curio has several very interesting things on display, to include unique jewelry pieces, mini mad hatter display pieces, and several decoupage items (i.e., shoes, ladies wallets, etc.) that use comic characters as their themes. PJ's booth simply cannot be missed. 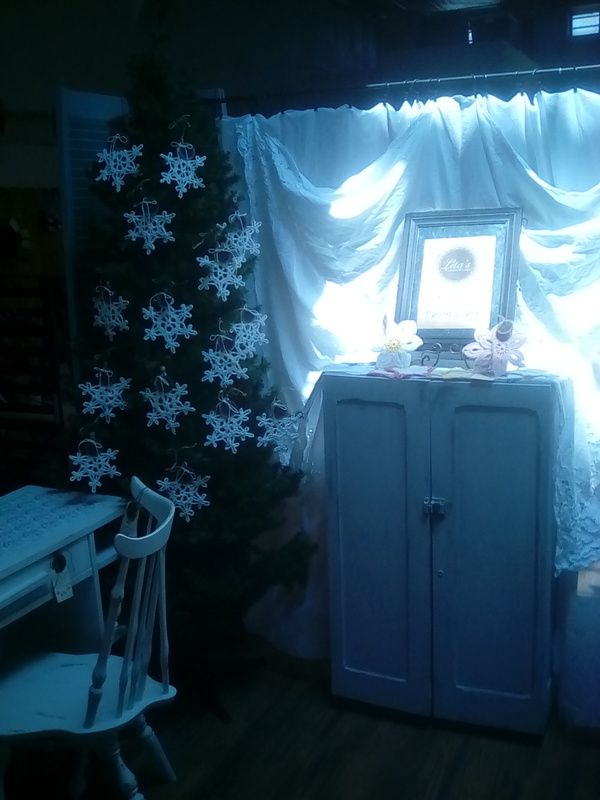 Besides it's large custom-built size, her booth contains a fun mix of rustic and creative selections. 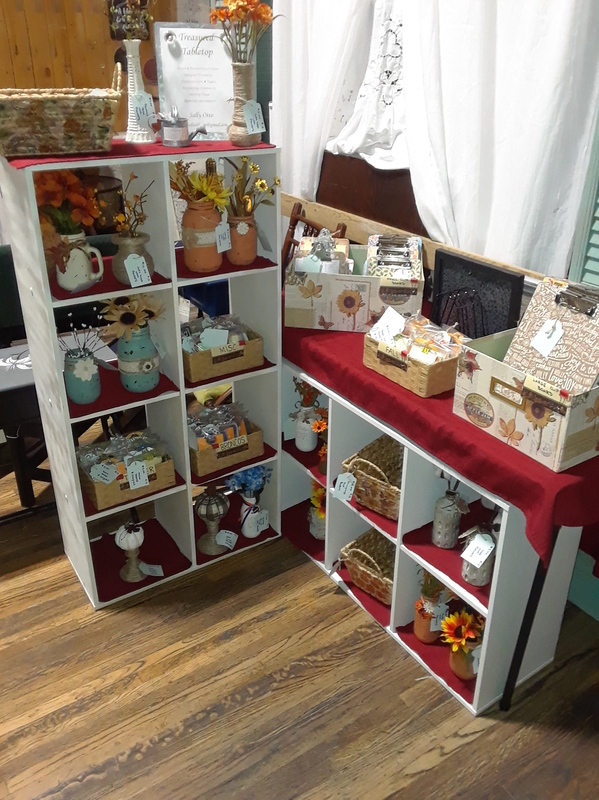 Come see what she does with ceramic tiles, too. 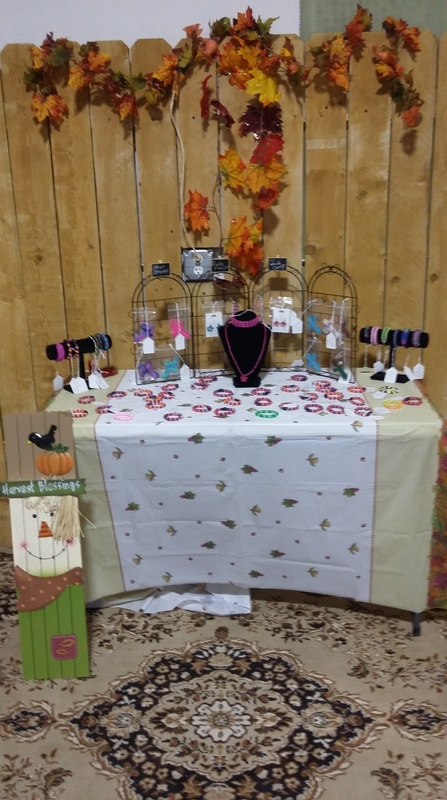 A Farm And Its Flowers & The Creative Bloom have teamed up in this booth to bring you unique items such as hand embrodered totes, tea towels, wall decor hoops, jewelry, crochet work such as baby booties, ear warmers, beanies, scarves as well as many vinyl transferred items such as baby onesies, mugs and much more. A Wood Touch and Crafts makes a lot of GREAT things your homes can't do without. 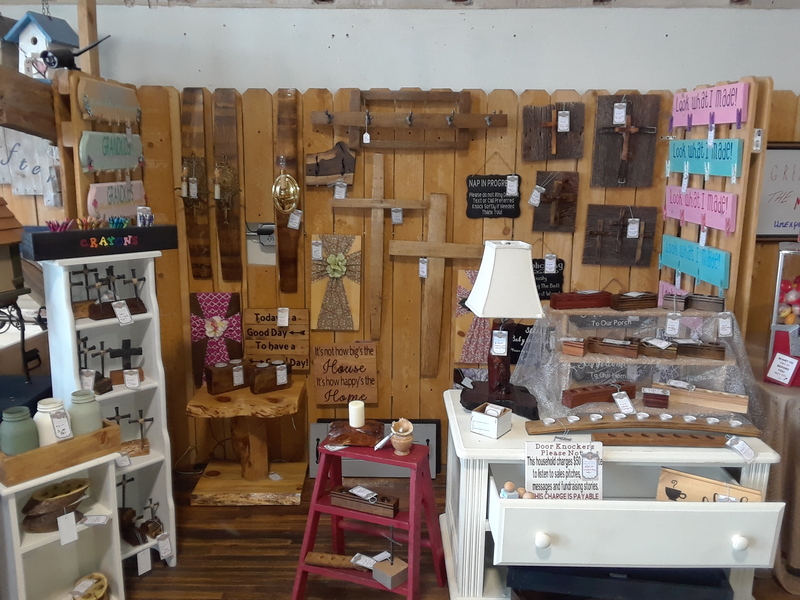 They make crosses and other things from barrel wood, rustic wood trays, and SO much more! 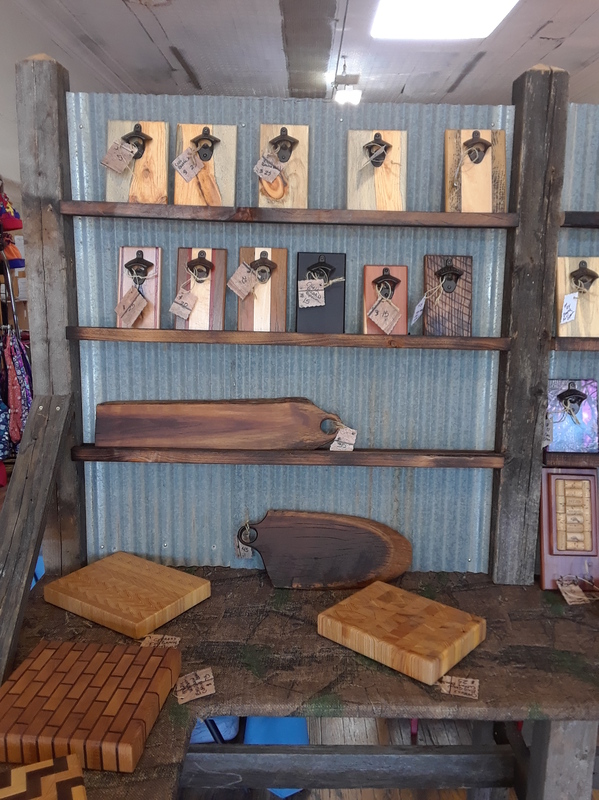 Unconventional Wood Works makes some AMAZING wood cutting boards and wood wall mounted bottle openers. You need to come in and see them in person to fully appreciate the work he does. 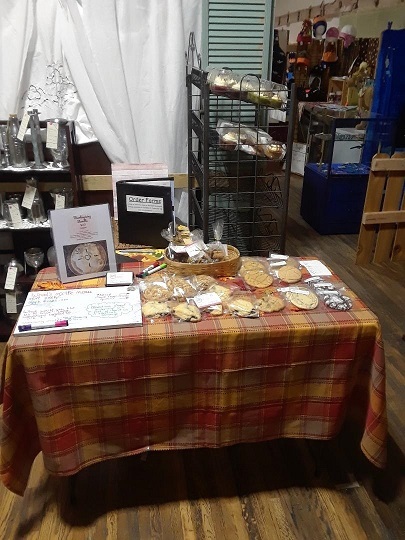 Devon's Delights make s WIDE variety of great baked goodies. She brings in fresh things every week, and moves the older tidbits to a "Clearance" rack at great prices. Come check them all out today! Art For The Spirit creates some very creative art prints, artistic art frames and more. People 1st creates a wide variety of attractive and extremely affordable jewelry. 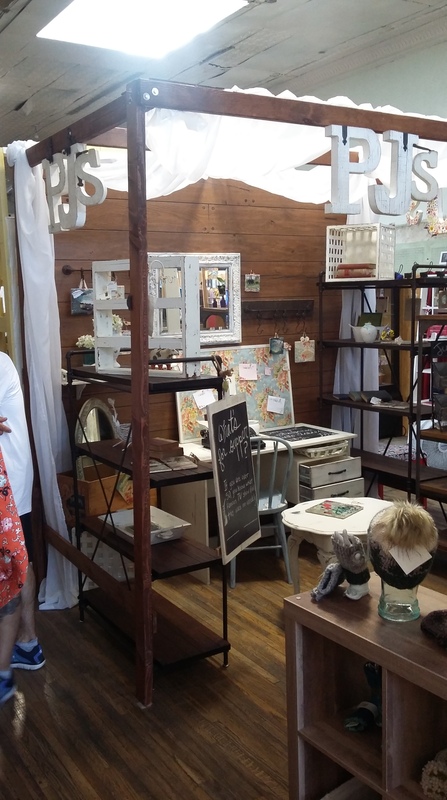 She sells it as part of how she supports some of our neighbors who have disabilities. Stick Trix works very hard at recreating or upcycling nice pieces of small to medium sized furniture, and ends up with SUPER nice results. Come see what he's finished lately. 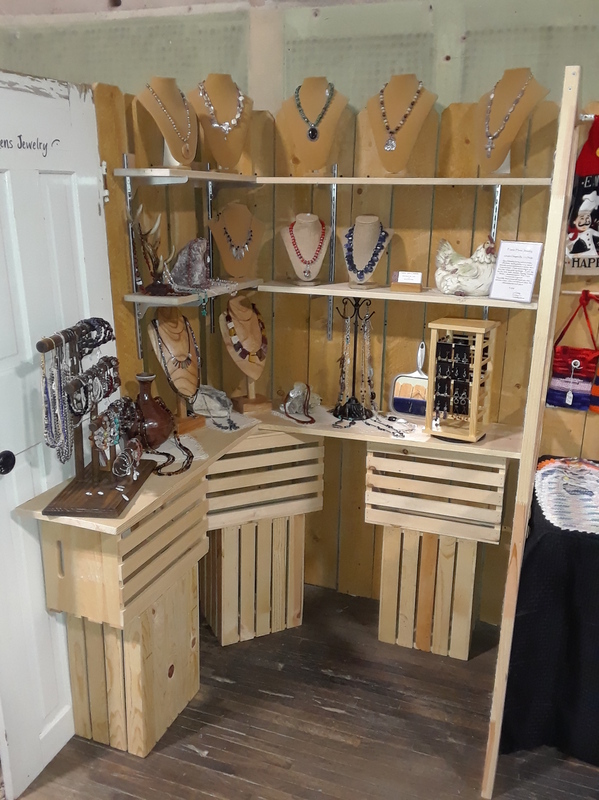 Prairie Hen's Jewelry makes beautiful southwestern style jewelry, come check out THIS booth when you visit our store soon! 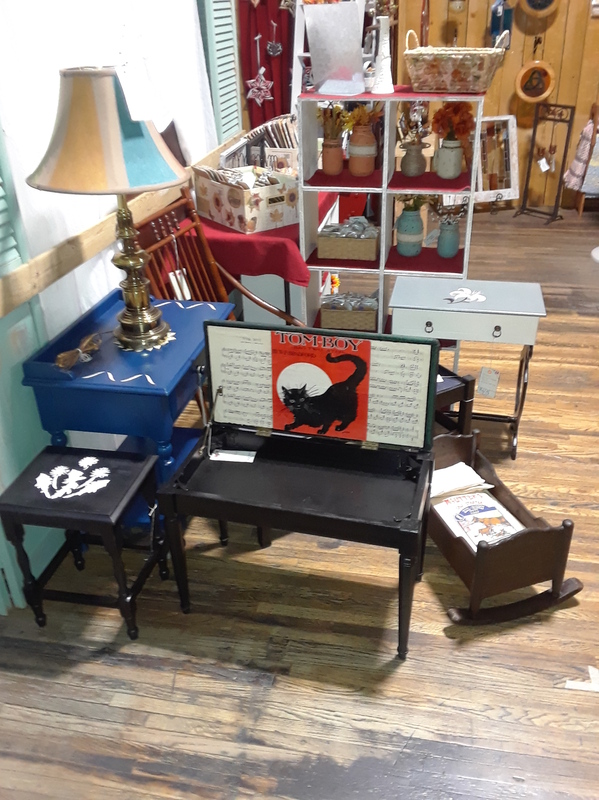 DBL J always has a lot of very nice upcycled and refinished small furniture items. Yarning By Carol creates a lot of very nice and extremely affordable decorative knitted items. 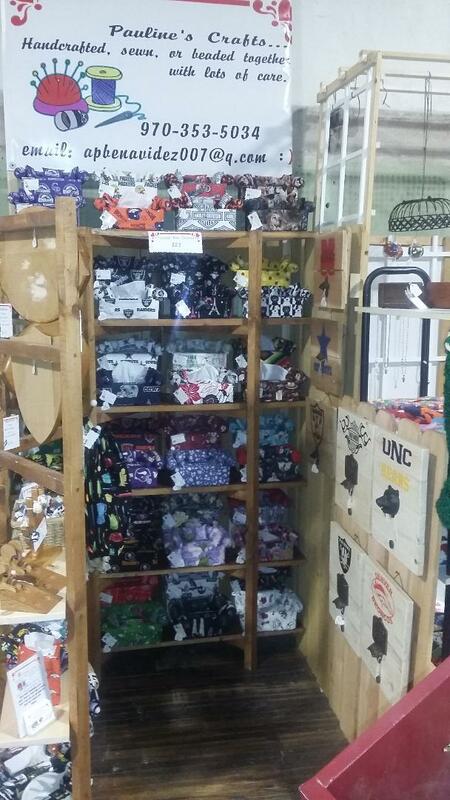 Those things include hand towels, pot handles, baby bibs, scarves and more. 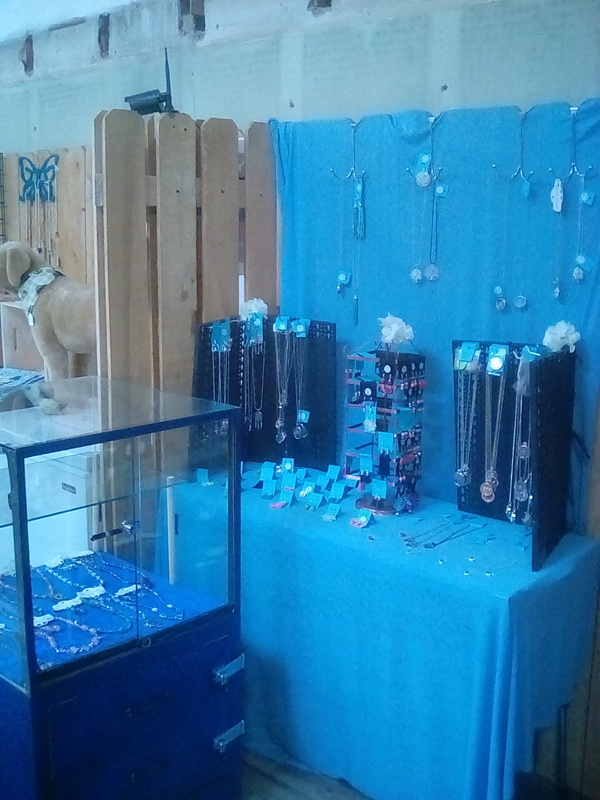 Bevanne's Boutique creates a wide variety of very unique jewelry, in a wide range of prices. 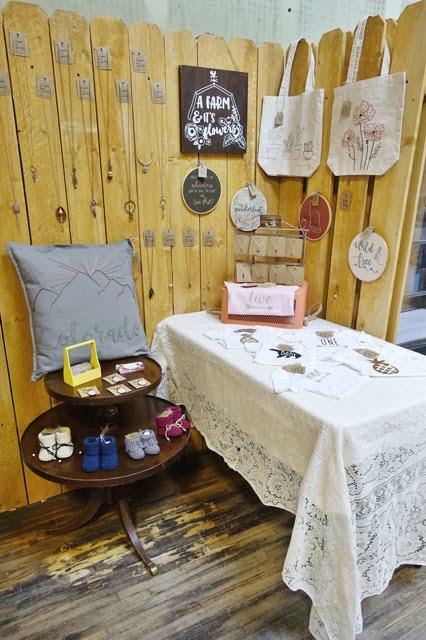 The Noble Home makes some beautiful linens, vintage furniture pieces, and more. 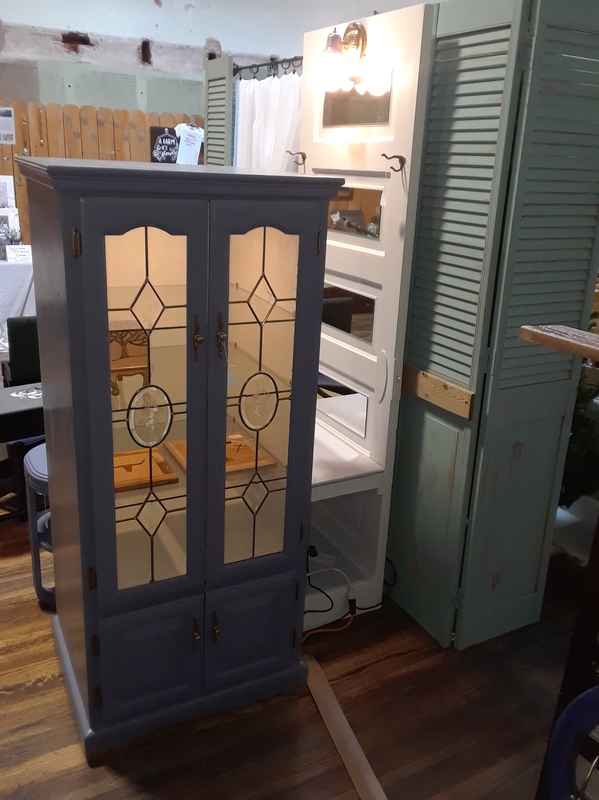 Jewelry Box Junction refurbishes smaller jewelry cabinets, boxes and storage units, bring them to live in very beautiful fashion. 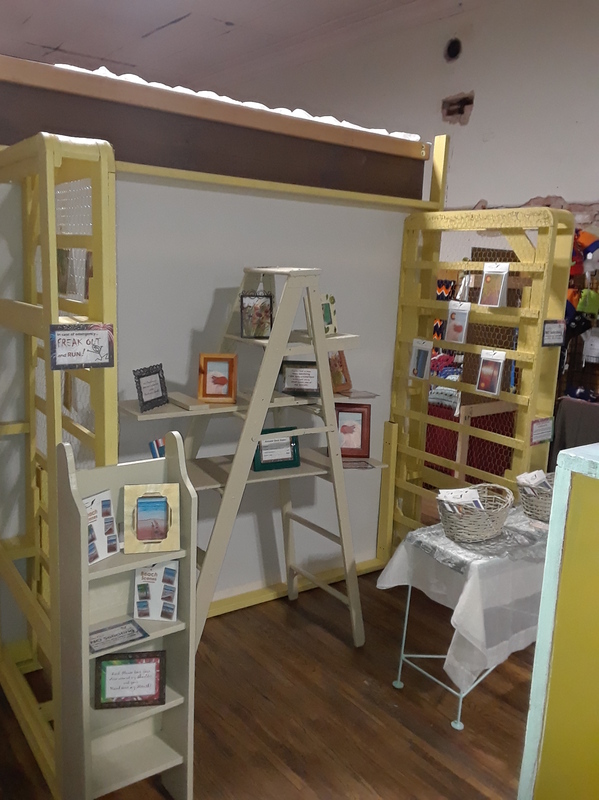 She's also expanding to create a variety of very affordable artistic pallet art pieces. 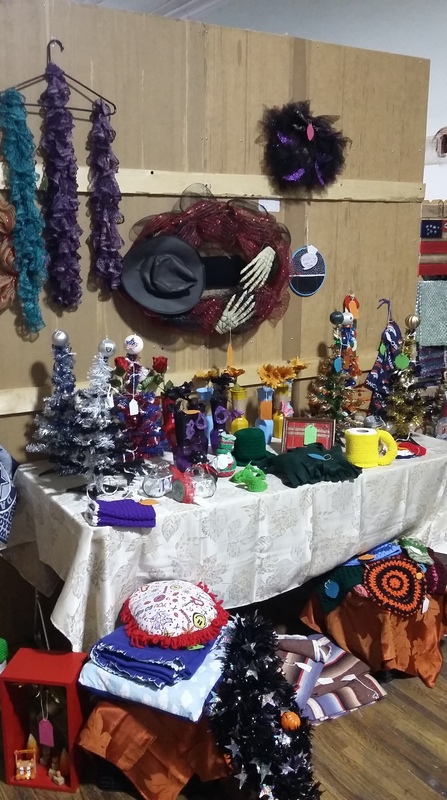 Sisters Plus creates some very interesting things, such as team Christmas trees, knitted goods, blankets, and more. You'll also LOVE their prices! Treasured Table Top. 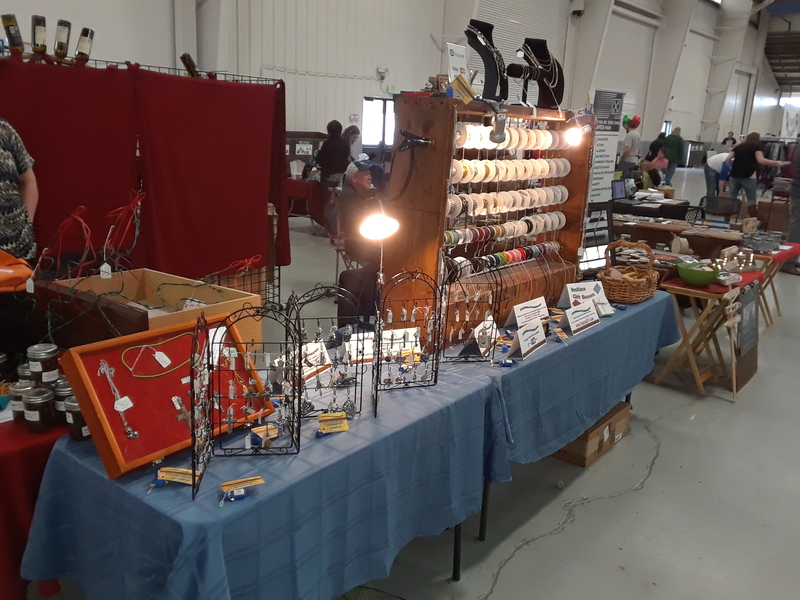 Check out the jute-wrapped vases, decorative notepads and clipboards, artistic mason jars and much more in this booth. Flipping Sisters. 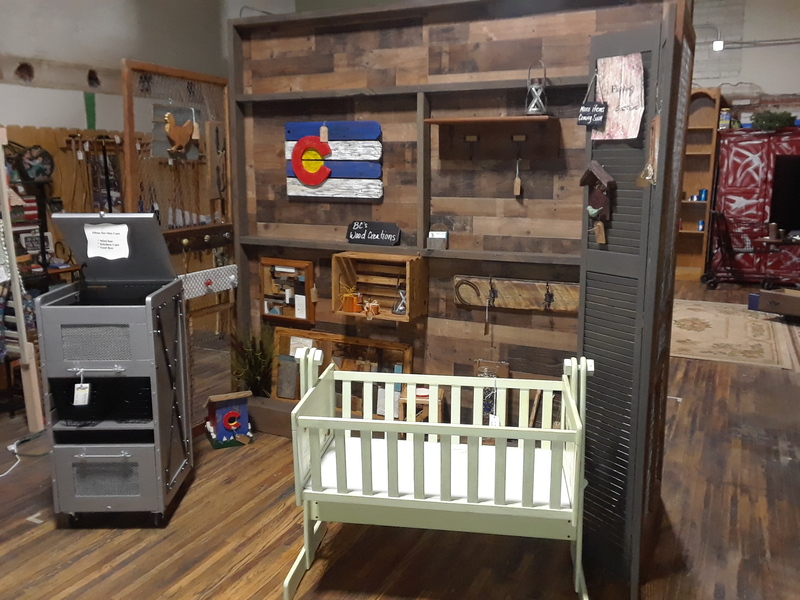 If you check out this booth, you'll find some cool upcycled small furniture, reclaimed wood creations, abstract wood art, and much more. 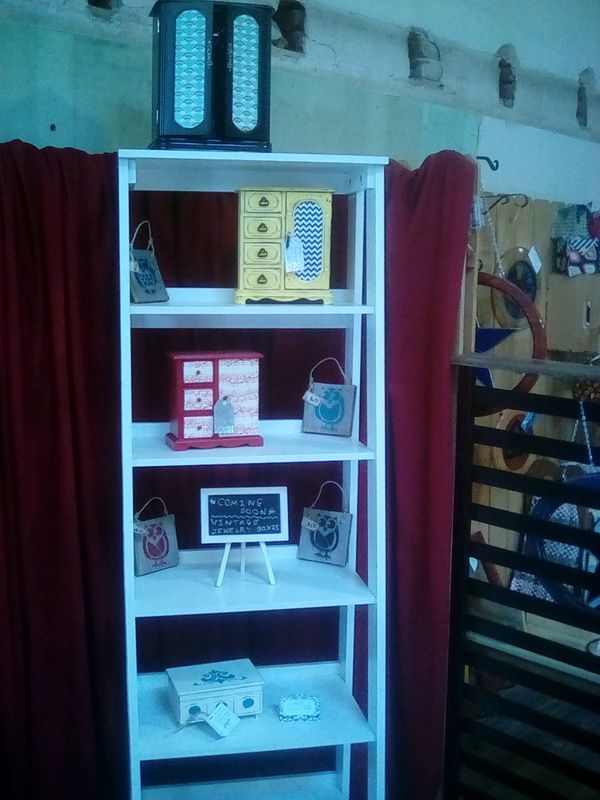 Pauline's Crafts has some extremely cool, and very affordable and cute tissue box covers that appear as miniature couches. She makes them in a wide variety of themes, such as pro sports teams, colleges, movies, and more! You'll also find some fantastic artwork with wood professional team signs. Dare to care, and come on out and check it all out for yourself. 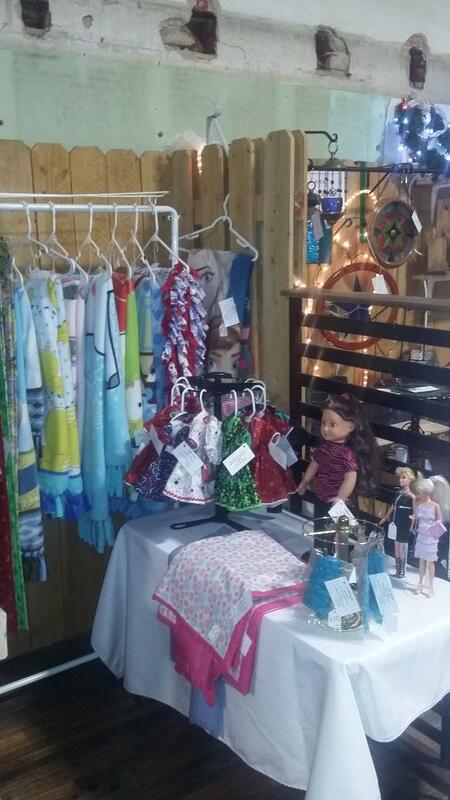 Crafts By Jo creates several WONDERFUL types of doll clothing and accessories, in a wide range of sizes. Her clothes and accessories fit everything from Barbie-sized dolls, to the American Doll. She even makes doll sleeping bags. Don't forget to also check out her very reasonably priced and comfy fleece blankets, too.